The Lakeville Historical Commission in conjunction with P. O. L. L. (Preserve Our Lakeville Landmarks) has recently published a new addition to its series of historical booklets entitled Lakeville's King Philip Tavern: An Illustrated History by Michael J. Maddigan. The King Philip Tavern of Lakeville, Massachusetts, enjoyed but a short-lived existence as an automobile inn in the decade following 1909 catering largely to tourists who traveled by automobile and made only brief stays before motoring on to their next destination. Such inns combining the amenities of the finest resort hotels with modern convenience and practicality were popular in the first quarter of the 20th century and anticipated the rise of roadside motor camps and cabins in the 1930s and motels in the post World War II era. In 1910, the year following its establishment, the King Philip was heralded as a “new breathing spot of the most attractive sort,” and despite the fact that it was leveled by fire nearly a century ago, the King Philip Tavern has become an integral part of Lakeville’s social history. 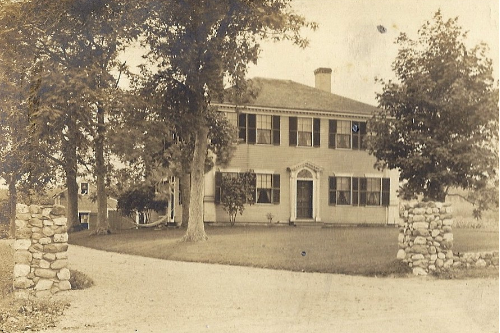 Originally a private residence owned first by the Washburn family of Lakeville and later by Fred C. Hinds of Newton who transformed it into a summer estate known as “Hindsmere”, the King Philip Tavern embodied the deep history of the vicinity. Today, few physical reminders remain to relate the story of the King Philip Tavern, and its site is now occupied by the United Church of Christ located in the historic Precinct Church at the junction of Precinct, Bedford and Main Streets opposite the equally historic Lakeville Town House. Yet, while the King Philip Tavern is no longer physically present, its tale is one which should not be relegated to history, for the story of this fascinating property and its immediate neighborhood touches upon the most important aspects of Lakeville’s heritage: its Native history and lore, the Federal era growth of the community and its subsequent “secession” from Middleborough in 1853, the incipient social development of Lake Assawompsett and surrounding ponds as a regional summer resort area following 1878, and the role these same lakes assumed as municipal water sources for the cities of southeastern Massachusetts with the incumbent issues and concerns which that status brought. It may in fact be argued that to a certain degree, the story of the King Philip Tavern is the story of Lakeville. [Taken from the book's preface]. Lavishly illustrated with dozens of color images and maps, the 44 page book documents the King Philip Tavern's origins, history and operation, as well as the rise of tourism along Lakeville's Assawompsett shoreline in the last quarter of the 19th century. Lakeville's King Philip Tavern is available for purchase at the Lakeville Town Clerk's Office and the Lakeville Historical Society Museum on Bedford Street, as well as from the Lakeville Historical Commission. The cost is $10 and all proceeds benefit the programs of the Lakeville Historical Commission. Previous booklets including Historic Pierce Avenue, Salute to Those Who Serve, Old Main Street and Crooked Lane & A Self-Guided Tour of Main Street, and The History of Hill Top Farm in the Words of Lydia W. Rotch are also available and would make a fine addition to your local history library. 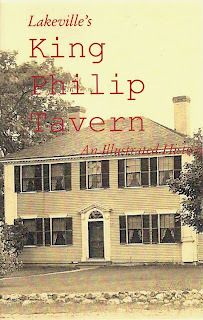 Lakeville's King Philip Tavern: An Illustrated History (Lakeville, MA: Lakeville Historical Commission and P. O. L. L. [Preserve Our Lakeville Landmarks], 2010), cover. King Philip Tavern, photograph, early 20th century. Though the tavern itself is no longer extant, the granite and white quartz walls visible in this picture remain and help the modern viewer place the tavern, the site of which is now occupied by the Lakeville United Church of Christ.